From left, Will Razor, Jessica Harper, Erica Sherrard and James Wilkerson with their finalist trophies. 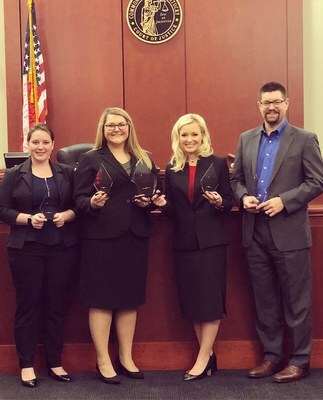 Students from the University of Louisville School of Law made impressive showings at the Intrastate Mock Trial Competition held November 2-4, 2018. Each of Kentucky's three law schools sent two four-person teams to the competition. Louisville Law was the only law school to have both of its teams advance to the semi-finals. One team, composed of Jessica Harper, Will Razor, Erica Sherrard and James Wilkerson, made it to the final round of competition. "The school should be immensely proud of all who competed," says Aida Almasalkhi, a 2016 Louisville Law graduate who coached the teams. Second-year student Lindsay Ratliff won the individual Best Advocate award for her oral advocacy skills. "I want to do litigation," Ratliff says. "I've always been very passionate about oral advocacy. It's one of the most important things lawyers do." In addition to Ratliff, other Louisville Law team was composed of students Ashley Baxter, Alana Johnson and Patrick Williams.